Skills beget thrills on an outrigger canoe on the ocean blue. Pride of Craftsmanship is something that Jason Dameron understands and values. Born-and-raised in Kailua on the island of O‘ahu, Dameron was a self-described “typical water baby,” like many residents of that beachside town. Dameron moved to Kaua‘i in 2004 for work, but for him, life’s constants have always been canoe racing, and a love for all-things-ocean. And it was a four-man canoe that he’d built him- self that led him to Kukui‘ula—he used his skills to build the sailing canoe that’s now used by the Huaka‘i Outfitters team for sailing adventures. 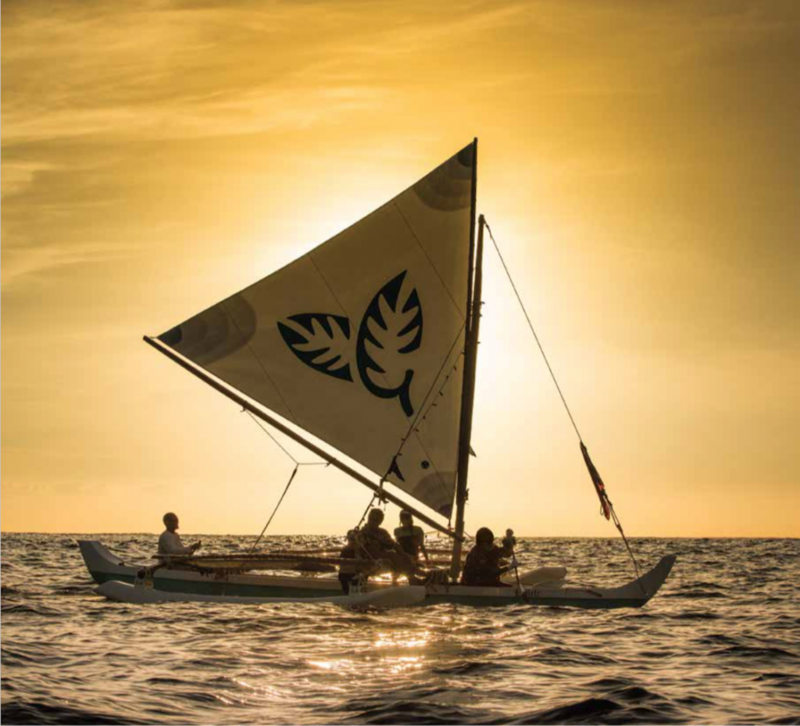 This canoe’s design draws an arrow-straight line to the craft that were used by Polynesian voyagers to cross the choppy channels between islands, and sail before countless ocean swells as they journeyed between the Pacific’s distant archipelagoes. The navigators and wayfinders of generations past relied on more than just fair winds and a star to steer by; reading waves, clouds, and birds’ flight patterns all informed the decision on which path to take, and like them, Dameron plots each trip’s course with nods not just to the weather and sea conditions, but to the wishes of his crew, the members and their ‘ohana. Inevitably, some guests who go out on the canoe will have never been on the ocean before, and some of them will want to approach that first ride with caution, asking for the gentle “cruise” experience, while others will want the unfiltered, surf-and-spray, downwind sleigh ride. Dameron is equally satisfied in delivering either one. His joy is in being on the water and sharing his passion and decades of experience with others, introducing them to all that there is to do and see while on a sailing canoe. What all excursions have in common, whether a pleasant sunset sail, to a more demanding off- shore excursion, is the steady hand of Dameron on the steering blade, and his expertise reflected in his ever-moving eyes. Scanning the horizon for gusts, reading the waves, checking sail trim, then a slow, dragging look across the taut trampo- lines, subconsciously counting the guests (good, all present and accounted for!) before feeling the stern rise, signaling the opportunity to sheet in, power up, and surf. All the guests feel is a subtle change in course, but if they looked carefully at Dameron, what they’d see is history and culture portrayed in his steersman’s skill; solid arms locking the steer- ing paddle against the hull, eyes locked on the pattern of spray coming off the outrigger’s bow as the straining sail fights to bury it in the ap- proaching trough. Nothing but skill separates this thrill from a spill, and an impromptu swim. in on the opposite side, altering course for the harbor, following the seabirds back to shore, the energy remains. It is as if the day’s excursion has distilled what centuries of sailing canoes have done: harness the wind and waves, and recharge the canoe’s passengers with their energy.